Your programs can be as simple as a printed sheet of paper or as complex as a booklet printed in full color. The most popular, however, is something that is in between the very simple and the very complex. Generally several pages that are folded in book style. Many times these are held together with ribbon in one of your wedding colors. When it comes to wedding programs, you basically have only a few options. 1) You can order your programs from your local printer or an invitation catalog. 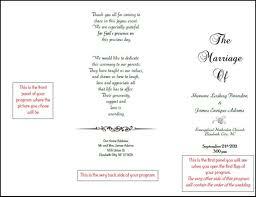 2) If you have the skills, you can design it yourself on a program such as Pagemaker or Photoshop, or 3) You can search around for wedding program templates that suit your style and theme and do it yourself in a word processing program. Many couples will choose to make the programs themselves because it saves money and they can put their own unique touches into the program. If you choose to use a wedding program template, there are many places on the internet to look, so you should be able to find the perfect template to suit your taste. The bride and groom's names and the wedding date. This is generally on the cover or at the top of the page of a single sheet. The names of the members of the bridal party and the names of anyone who will be performing music or readings. The name of the officiant and the names of all parents. A timeline of the events of the ceremony. This way your guests can follow along which will make them feel as if they are part of the action. If your wedding will include any traditions or rituals, give a brief description and it's significance. Do include any instructions your guests may need. The names of any honored or special guests.